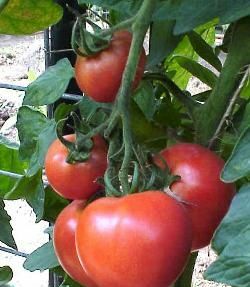 We all know that a ripe tomato, picked fresh from the garden, is one of the tastiest treats around. But a new study bolsters the evidence that including tomatoes in your diet provides excellent health benefits as well. According to an article on the Science News website, a recent study done in Finland showed that men with high blood levels of lycopene — the antioxidant compound that gives tomatoes their red color — are about half as likely as men with low lycopene levels to suffer a stroke. Lycopene has already been demonstrated to have other positive health benefits, including reducing inflammation, reducing cholesterol levels, and preventing blood vessel disease. Researchers can’t say for certain that it is just lycopene alone that is helping to reduce strokes, since tomatoes contain lots of other healthful nutrients. But you certainly can’t go wrong adding plenty of tomatoes (and other fruit and vegetables high in lycopene like red peppers, watermelon, pink grapefruit, and guavas) to your diet on a regular basis. To read more about how lycopene in tomatoes may reduce stroke risk, go to: Science News.